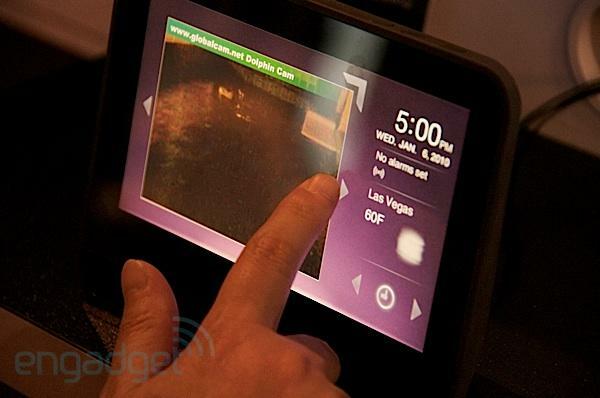 If you’re the socially connected type, then the Sony Dash, being shown off today at CES 2010, is the perfect gadget for you. Sony are calling it a Personal Internet Viewer, but you can think of it as a digital photo frame on steroids. Whereas today’s digital photo frames will let you view pics (obviously!) and videos, as well as a few other crude apps such as time and a calendar, the Sony Dash displays all your social media applications on a glorious capacitive touchscreen, letting you flick through them easily as if it were an obese touchscreen smartphone. Sony envisage this as a device for the kitchen, lounge or bedroom (replacing your alarm clock), but with the amount of information it can provide, it’s hard to see how you’ll ever have time to cook or even get up! More details of the Sony Dash after the jump. The Sony Dash looks simply gorgeous! Not only does it look great, its interface is superb, and the information it displays is perfect if you’re permanently hooked into your social media lifestream. It really is one of those gadgets that evokes instant gadget lust! It’s based on the Chumby platform, so supports over 1,000 apps, including all the usual suspects (Twitter, Facebook, Flickr, YouTube, etc.). You can see the apps in either small gadget mode or full screen, choose which apps you want displayed and where and tailor the device to your own personal preferences however you want. The Dash has WiFi built-in and pulls in all the info it needs automatically, so you can see new tweets or updates in real-time without having to refresh. The Dash also features its own speaker, as well as a headphnoe jack, and supports a number of Internet radio services, including Pandora and ShoutCast. Using the Dash is simplicity itself, as it uses the same touch gestures we’re all used to now. Indeed, we’re so used ot them, it makes you wonder how we ever used gadgets without a touchscreen! My only concern is just how am I supposed to get out of bed if I had a Dash? I already struggle to tear myself from the TV in the morning before I go to work. I wouldn’t even make it out of bed if my alarm clock also showed me all my friends’ Facebook statuses, tweets and pictures as well! I can see it being really useful in the kitchen, though, as cooking is terminally dull, and in my perennially distracted state, having real-time updates of all that I’m interested in would be a god-send. No more watching the kettle boil (which apparently it never does while being watched) when you’ve got YouTube to watch instead! The Sony Dash looks glorious and is seriously tempting for the socially addicted. It’ll cost jsut $199 when it’s released in April, which will make it even more tempting!